Most everyone has heard that Jesus is supposed to return at some unknown time  to rule the earth. Upon his return to earth, Jesus' first order of business is to defeat the then current world-ruler, the Antichrist and his armies . After his victory at the Battle of Armageddon, he then can set up his government, the Kingdom of God. The first thousand years of its rule (Rev 20:4) is commonly referred to as the Millennium. While some Christians are aware of this term, very few have a concept of what the Millennium will be like. Note that some have believed that the 1000 years is not really literal, but is merely figurative language for an unspecified long time. Nevertheless, Revelation 20 uses the phrase "the 1000 years" six times to refer to this period. Could it be trying to tell us something? Further, other verses repeat this same 1000 years and also point to the Millennium being a fulfillment of the seventh day Sabbath, a day ancient Israel was commanded to rest from their labors on. In other words, the Sabbath day is an foreshadow or anti-type of the coming “Sabbath millennium” following six millennia that the other six days of the week foreshadow or typify. With that background explained, let's get an idea of the Millennium by looking at ten changes that Bible prophecy describes for this time. #1. The New Form of Government: "Glorified Monarchy"
Ever since Adam left the Garden of Eden, man has been ruled by other men with very bad results. The problem with men ruling is twofold: First, humanity's natural inclination is evil. We're all familiar with the horrors of despots and dictators of the past and present (like North Korea). Even good men are still corruptible with time. Power corrupts and absolute power corrupts absolutely. King Solomon, the wisest man who ever lived, still turned away from God. Second, even when a ruler is good and avoids corruption, there's still the problem that he is mortal. When he dies he will most likely be replaced by somebody wicked. The Book of Kings bears out this pattern. I heard Chuck Missler make the observation that "the people of God are always one generation away from apostasy" for this very reason. This sums up well the problem of the mortality of righteous rulers. Revelation 20:4 — Then I saw thrones, and people seated on them who were given authority to judge. I also saw the people, who had been beheaded because of their testimony about Jesus and because of God’s word, who had not worshiped the beast or his image, and who had not accepted the mark on their foreheads or their hands. They came to life and reigned with the Messiah for 1,000 years. However, those rewarded saints will have glorified spirit bodies instead of the physical ones they had in their previous life. The lust of the flesh will be gone along with their mortality. This means they will not be corruptible nor will they ever die and be replaced by a wicked ruler. The benevolent rule of Jesus and his saints will be continuous. The resulting peace and prosperity will be unprecedented and ever increasing (Isaiah 9:7). Thankfully, these future glorified saints who rule the world won't be like the vast majority of judgmental, hypocritical Christians you experience today, lacking faith (Lk 18:8), gentleness and the rest of the fruits of the spirit in general (Gal 5:22-23). Only the believers in history who have adopted the law of love (Gal 6:2=John 13:34) that Lord Jesus required (Lk 6:46=Mt 7:21) will be given eternal life. More on that here . By the way, if you had always thought that the destiny of the righteous was to live up in heaven with Jesus, this may come as a surprise. It turns out that "the meek shall inherit the earth" (Ps 37:11; Mt 5:5) is indeed literal and not poetic. The glorified saints of God will rule with King Jesus on the earth, not in heaven (Rev 5:10). Stopping evil men from ruling the world is a crucial change for the Millennium, but it only addresses one source of the evil control of the world today. The Bible tells us we do not fight against flesh and blood but against spiritual forces of evil (Eph 6:12). Which spiritual forces? Satan, the fallen angel, is the main culprit as the leader of the dark spirits who is responsible for actively deceiving everyone in the world (Rev 12:9). Revelation 12:3-4 — 3 There was a great fiery red dragon having seven heads and 10 horns, and on his heads were seven diadems. 4 His tail swept away a third of the stars in heaven and hurled them to the earth. Jude 1:6-7 — and He has kept, with eternal chains in darkness for the judgment of the great day, the angels who did not keep their own position but deserted their proper dwelling. The second type of evil spirit helping Satan are the demons. Jesus and his disciples contended with them in the New Testament. These are different from the angels. The angels have the ability to manifest in human bodies on earth or appear as angels of light. The demons are less powerful and seek to take over humans, even animals if need be. Revelation 20:1-3 — Then I saw an angel coming down from heaven with the key to the abyss and a great chain in his hand. 2 He seized the dragon, that ancient serpent who is the Devil and Satan, and bound him for 1,000 years. 3 He threw him into the abyss, closed it, and put a seal on it so that he would no longer deceive the nations until the 1,000 years were completed. After that, he must be released for a short time. Plainly, the way the fallen angels like Satan are restrained from causing trouble in the Millennium is by being kept alive in prison (to be judged later - 1Co 6:3). The demons are dealt with differently; they are destroyed by being sent to the lake of fire, whether they have a physical body at the time or not (Rev 19:20). With the current influence of the evil spirits gone, people will not be deceived or as tempted or incited to sin as they are today. (Not every evil thought or inclination you have came from your own mind). This will go a long way in making the world a much kinder, gentler and better place. When you have wicked men and wicked spirits leading enough of the world's nations, it does not just bring injustice and much personal suffering. National conflicts are unavoidable as well. The fourth seal or pale horseman describes the intensification of this problem through progress and technology. We are told in the famous passage repeated twice in Scripture that all nations will abolish their armies and all weapons will be recycled. Isaiah 2:4 / Mic 4:3 — He will settle disputes among the nations and provide arbitration for many peoples. They will turn their swords into plows and their spears into pruning knives. Nations will not take up the sword against other nations, and they will never again train for war. Today there are only a few countries that have no standing army. The country I live in, Costa Rica, was the first to formally abolish the military. Imagine a world where every single country does this. All that money budgeted for defense could be reallocated to health, education, infrastructure and other things that raise that standard of living. More importantly, the long elusive hope of world peace (that every Miss America pageant finalist has vowed to labor for) will finally be achieved! #4. Life Spans of Over 100 Years - Disease Gone? I remember when I first read the Bible at the age of 16. As a Catholic, I was unprepared for what confronted me right away in Genesis. I had no idea that the Bible matter-of-factly gives the ages of Adam and his offspring at over 900 years. It was quite a surprise and more than a little bit disturbing considering today's average life spans of around only 65 years. I had no way to explain it and I hoped no one ever challenged me on believing a book that taught such a ridiculous-sounding thing. Sometime later, I found a book on creationism at the library. It offered evidence for how the antediluvian world was probably much different than today's earth. Through these differences it explained how the longer life span recorded in the Bible was possible. The answer was certainly satisfying in the short-term but in the lesson it provided was more profound. Isaiah 65:20 — In her, a nursing infant will no longer live only a few days, or an old man not live out his days. Indeed, the youth will die at a hundred years, and the one who misses a hundred years will be cursed. If one hundred years is considered a “youth”, then obviously old age must be more, perhaps several hundred years. Under God's government people will be generally righteous and loving instead of “desperately wicked” as Jeremiah describes them today. I think this was the chief reason God shortened the human life span. By the way, who are these non-glorified/physical people in the Millennium and what happens to them when they die? First, these are the few "wicked" who survived Wormwood , the Great Tribulation , and God's wrath . Because they survive against all odds, the mark of the beast  is taken off them. Because they missed the rapture and first resurrection, when they die they will come up in the second and/or third resurrection depending if they died wicked again or righteous . If they die righteous in the Millennium (most likely) they won't need to come up in the physical second resurrection. They will simply await the third where they become glorified just like the people in the rapture/first resurrection become. The mention of no more crib death and promise of the end of premature death tells us something else about another major change coming: great general health. If premature death is rare in all age groups then obviously sickness and disease must not be an issue in the Millennium. How is this possible given that even modern medical science has not cured even the common cold? This prediction is one I have never had a problem believing or explaining. In my teens I came across books on the long-lived Hunzas of the Himalayas. They lived 120-140 years old with amazing vitality through raw and natural food eating and an isolated environment free of toxins and the bad effects of civilization. Adam and Eve were told that their food was herbs and it was only after the flood that meat-eating was introduced. I can't help but wonder if the cleanup of the environment and people receiving education on healthy eating rather than being marketed foods based on taste and profit for food companies would not make all the difference? This change is one of the most unexpected. We are used to a world filled with violence and cannot imagine it any other way. With the violence of men restrained and retrained by the new government, things in the world will be much safer. The world's "most dangerous predator" (man) will be tamed. That would leave the world's second most dangerous predators: the carnivorous animals as the greatest threat to living out your nice enhanced long millennial life span. You probably have heard when Jesus comes back that the “lion will lay down with the lamb”. You may have thought it was poetic. It is quite literal, although it does not say lion, it says wolf. And it also indicates the nature of the animals will change to also not be afraid of men like they are today (back to how they were in the Garden of Eden). Isaiah 11:6-8 — The wolf will live with the lamb, and the leopard will lie down with the goat. The calf, the young lion, and the fatling will be together, and a child will lead them. 7 The cow and the bear will graze, their young ones will lie down together, and the lion will eat straw like the ox. 8 An infant will play beside the cobra’s pit, and a toddler will put his hand into a snake’s den. Isaiah 65:25 — The wolf and the lamb will feed together, and the lion will eat straw like the ox, but the serpent’s food will be dust! They will not do what is evil or destroy on My entire holy mountain,” says the Lord. Hosea 2:18 — On that day I will make a covenant for them with the wild animals, the birds of the sky, and the creatures that crawl on the ground. I will shatter bow, sword, and weapons of war in the land, and will enable the people to rest securely. This means no more shark attacks or any other attack you're used to hearing about. More amusingly it means your pet cats (and dogs) will cease to eat meat. You will be able to let them outside to graze on the lawn when they're hungry =). No more expensive, smelly cat or dog food. Can you say utopia? By the way, you may be thinking you've already seen your cat or dog eat grass. Yes, they do this such as when they are sick but usually not very much and what little they eat they throw up. That's not quite the diet of grass that the Bible is predicting for current carnivores. #6. One Language Again - Tower of Babel in Reverse? Everyone can relate to the frustration of not being able to understand people around you because they are speaking a foreign language. Having lived overseas for many years, this is a regular experience for me. It leads to confusion, misunderstanding, alienation, conflict and even, at times, violence. Imagine how great a world it would be without this source of friction holding back progress and the ready sharing of information. Well, you don't have to imagine only. You can read about it in the Bible. It's easy to forget today, but mankind was not always divided by myriad languages. Genesis records how the whole world was of one language (Gen 11:1). But the unity and information-sharing benefits of one common language caused a problem. The progress of man was so great and rapid that God knew nothing would be impossible to man (throwing off God's plan) (Gen 11:6). The Tower of Babel ascending to heaven was evidence of this fact. So God went down to confuse the languages there, and the rest is, as they say, history. Zephaniah 3:9 (HCSB) — For I will then restore pure speech to the peoples so that all of them may call on the name of Yehovah and serve Him with a single purpose. Admittedly, it's not 100% clear from Zephaniah that a return to a common tongue is what is being predicted (for example, see Zech 8:23 that may indicate languages continue in the Millennium). But it does makes a lot of sense that a wise and godly government would establish at least a universal language to make things easier. There is already something similar proposed today, an invented language designed for simplicity called Esperanto. Under such a scheme, everyone would learn their native nation or culture's tongue and one other language, the universal tongue. In the spirit of a "restoration of all things," this will probably be Hebrew, the language everyone spoke before the Tower of Babel (as suggested by Ebonics and the fact that all the pre-flood names in the Bible are Hebrew). By the understanding of most Christians, the nation of Israel serves as a cautionary tale and not much more than that. They believe that the identifiable remnant of Israel today, the Jews, are cursed for both their rejection of God in the OT and of Jesus in the NT. (Just look at the Holocaust and anti-semitism.) Some even think that the church has replaced Israel, becoming a sort of spiritual Israel, much like Replacement Theology teaches. Of course Replacement Theology took a major blow with the rebirth of Israel as a nation in 1948. Nevertheless, if you asked most Christians today, they would still say they believe that they have replaced Israel or that the tiny nation of Israel is never going to be great, let alone God's model nation again. Ezekiel 37:21-25 (HCSB) — 21 tell them: This is what the Lord GOD says: I am going to take the Israelites out of the nations where they have gone. I will gather them from all around and bring them into their own land. 24 My servant David will be king over them, and there will be one shepherd for all of them. They will follow My ordinances, and keep My statutes and obey them. 25 They will live in the land that I gave to My servant Jacob, where your fathers lived. They will live in it forever with their children and grandchildren, and My servant David will be their prince forever. There's no doubt about the verse's millennial context given the mention of King David being their prince forever (obviously resurrected at the start of the Millennium to a glorified body giving him the eternal life he needs to rule them forever). Ezekiel 37:26-28 (HCSB) — 26 I will make a covenant of peace with them; it will be an everlasting covenant with them. I will establish and multiply them and will set My sanctuary among them forever. 27 My dwelling place will be with them; I will be their God, and they will be My people. 28 When My sanctuary is among them forever, the nations will know that I, the LORD, sanctify Israel. Not only will Israel be brought back into their own land, they will be given a place of prominence among the nations. God's very dwelling place will be among them. Another passage shows how God will use the people of Judah to teach the world his ways. Judah's territory, Judea, was where the temple of God was historically located. Romans 11:26 (HCSB) — And in this way all Israel will be saved, as it is written: The Liberator will come from Zion; He will turn away godlessness from Jacob. Acts 1:6-7 (KJV) — 6 When they therefore were come together, they asked of him, saying, Lord, wilt thou at this time restore again the kingdom to Israel? 7 And he said unto them, It is not for you to know the times or the seasons, which the Father hath put in his own power. After the last surprising change about the forgiveness and restoration of Israel, hopefully the Christian reader may now be ready to consider this most shocking prophesied change. The "done-away," "nailed to the cross," "curse of the law" Torah is coming back. Jeremiah 31:31-33 (KJV) — 31 I will make a new covenant with the house of Israel, and with the house of Judah: 32 Not according to the covenant ... which ... they brake... 33 But ... I will put my law in their inward parts, and write it in their hearts; and will be their God, and they shall be my people. It's important to notice how this passage specifically states that this covenant is made with Israel and Judah, not the church. It also is clear that the law is again part of the covenant. However, unlike with the previous Old Covenant of Moses, this time the law will be written on people's hearts so that they can succeed in keeping it. Isaiah 66:23 (HCSB) — All mankind will come to worship Me from one New Moon to another and from one Sabbath to another,” says the LORD. Zechariah 14:16-19 (HCSB) — 16 Then all the survivors from the nations that came against Jerusalem will go up year after year to worship the King, the LORD of Hosts, and to celebrate the Festival of Booths. 17 Should any of the families of the earth not go up to Jerusalem to worship the King, the LORD of Hosts, rain will not fall on them. 18 And if the people of Egypt will not go up and enter, then rain will not fall on them; this will be the plague the LORD inflicts on the nations who do not go up to celebrate the Festival of Booths. 19 This will be the punishment of Egypt and all the nations that do not go up to celebrate the Festival of Booths. But don't worry, it certainly won't be the same. For example, slavery and women being treated as property do not fit in our enlightened times like they did in ancient patriarchal cultures. (For those who doubt this and drone, "the Torah is eternal, it can't change! ", I suggest a study on the changes in the Torah within just one generation between Exodus and Deuteronomy, the second giving of the Torah.) It will still be about love, justice and building a superior society. Nevertheless, despite PETA and other groups educating the world on the idea of animal rights and cruelty, the animal sacrifices of Moses will return. Ezekiel 40-46 detail the coming millennial temple (sanctuary) and the many sacrifices to be done there. This idea of animal sacrifices returning sounds dead wrong to Christians because they think Christ came to end and replace them with his own sacrifice. However, no verse explicitly says that. Instead, Hebrews tells us that the sacrifices never could take away sin (Heb 10:4), but merely served as reminders of sin (Heb 10:3), or object lessons, if you will. See Why Animal Sacrifices? for more details on this controversial topic. Briefly put, since there will still be fleshly forgetful temptable humans as subjects of the kingdom (who the glorified saints rule over), the ritualistic object lessons will continue to be helpful reminders of sin. Christians also forget that the sacrifices were still going on when the believers in Acts went up to the temple daily at the time of prayer (Act 2:46). They did not go to protest the sacrifices =). Also Paul did an animal sacrifice (Act 21:26). They all knew animal sacrifices were not against Christ and his work, but honored it. Animal "Violence" or "Suffering" in the Millennium? I'm really heartbroken and extremely confused. I always looked forward to a time of ZERO violence ( wolf lying with the lamb, etc) and that was what I've been waiting and dreaming of my entire life. Now I've learned that animals will still suffer and it destroys my soul ( I'm crying as I type this). She's of course referring to Isaiah's millennial prophecy that they will neither "hurt nor destroy" at that time (Isa 11:8-9). However, I think there's a couple misunderstandings in her question. Number one, Jewish animal sacrifice is done in a humane, painless way with a sharp knife , not using the efficient, but painful, stun bolt method of slaughter houses. Secondly, as such, I would not classify the throat incision to drain the animal's blood violence any more than I would classify a surgeon's knife operating on us for a medical intervention as violence. As explained above, God has commanded animal sacrifices for a good purpose and in the same way we opt to go "under the knife" for a good cause, usually to better our health. Neither cases are violent. Nor is their sacrifice necessarily best classified as destruction. Many of the animal sacrifice are eaten by the priests as food. All the people eat the Passover lamb sacrifice which foreshadowed Jesus's death. It will continue to "backshadow" his death in the Millennium. The others that are consumed by fire on an altar are done in worship to God with great meaning. I wouldn't classify that as a destruction either like someone going out and hunting for fun and leaving the carcasses to rot. Like John Lennon, skeptics and atheists today would love to see a world free of religion. Surprisingly, their vision is not only inevitable, but, of all people, Jesus is the one who will make it happen. Unfortunately for them, along with religion, atheism and skepticism will also be forced out. Let's cover that latter statement first, since it's pretty obvious. 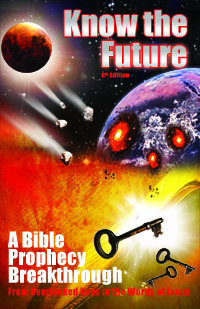 You've probably heard that Jesus will rule the earth with a "rod of iron" (Ps 2:9; Rev 2:27; 12:5; 19:15). We already saw an example of that above where the nations that do not obey the Torah command to go up to the Festival of Booths will be punished with drought (Zec 14:19). Pretty harsh correction, indeed, but it accomplishes two things. It not only corrects the bad behavior, but it also demonstrates the supernatural power behind the government and its laws. That type of evidence of God and his power is why I say that in time the "religions" of atheism, agnosticism or skepticism will disappear. There will be no denying the supernatural or God anymore. The supernatural will come and bite you in the rear when you doubt it enough to disobey! The Millennium's widely available, clear and complete teaching about God and his ways are going to make doubt about God's existence or his will look ridiculous (in ironically the same way most people view Creationists today). It's this very doubt today that makes room for not only skepticism, but all the false religions of the world. Yet I wouldn't say that Jesus will outlaw Islam, Buddhism, Hinduism, Catholicism, and all the contradictory forms of Protestantism. He won't have to. I don't think anybody will want to follow these invented traditions of mere men anymore when the supernaturally powerful way of God himself is at last so accessible and plainly clear to the whole world. If you have ever read the flood account in Genesis 7 and 8, you may have noticed something interesting about the length of the flood. Most Christians know that it rained "40 days and 40 nights," but the flood did not last only 40 days. Genesis twice records how the waters surged on the earth for 150 days, or nearly half of a year (Gen 7:24; 8:3). Curiously, Genesis takes time to note the exact dates that those 150 days begin and end on: 02-17 (Gen 7:11) and 07-17 (Gen 8:4). This means that the flood of 150 days was exactly five months in length. 150 days divided by five months comes to an even 30 days per month. On the modern Jewish calendar (based on the Bible) this is impossible. Months alternate between lengths of 29 and 30 days. There are never five 30 day months in a row today. But in the Bible there were; pointing to every month being 30 days long. Of course, this also suggests a 360 day year (12 months x 30 days = 360), rather than a 365¼ day year like we have today. If you think Genesis is mistaken, consider that over fourteen ancient calendars also use 360 day years. Also consider that the circle has 360 degrees in most cultures, as it is to this day. Were all the ancient astronomers and mathematicians so inept at counting? Did they all come to the exact same mistaken count, too? Now skip from the first book of Bible to the last and look at the numbers there. Revelation and Daniel record in six places the length of the Great Tribulation. Surprisingly, these passages together attest that the Great Tribulation will be exactly 1260 days or 42 months or 3½ years. When you do the math on that, we again end up with a 360 day year with a 30 day month. Again, not matching today's solar and lunar cycles, respectively. Technically this change comes before Jesus arrives to usher in the Millennium. This means that by the time the Millennium is ready to begin, the clock of the earth will be reset or restored back to what it was in the beginning. Another surprising change in store for the Millennium. If you want to know how the calendar changed from 360 days the first time and how it will change back again, check out this article on the coming calendar change . Now that you understand the Kingdom of God coming to earth in the Millennium better (from #1 above), would you like to understand the Good News of the Kingdom, the gospel that Jesus taught and that is prophesied to return to earth before the end begins (Mt 24:14)? Related to this, Katrina had an amazing "God-incidence" answer to a prayer of repentance while picking cranberries in the woods. She recorded the story on video in one of her On the Narrow Path vlogs. When I heard the story, I immediately saw how well it demonstrated the little-understood Gospel of the Kingdom of God that Jesus taught.